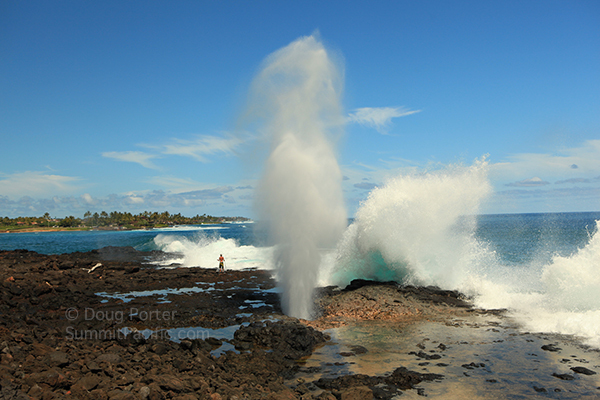 Spouting Horn is an ocean blowhole near Poipu Beach, Kauai. This geologic feature was formed from an ancient lava tube. As waves crash against the shoreline, water is forced through an opening below the surface and travels under the rocks erupting upward through a small hole. At high tides and high surf conditions the spray can shoot as high as 50 feet into the air. A few feet away, through an adjacent hole, compressed air escapes and makes a thundering roar and hissing noise with each eruption. Legend of Spouting Horn: Hawaiian legend says that a very large lizard or "mo'o" guarded this coast and ate fishermen and anybody else that got too close. Once when a brave man named Liko entered the water he was attacked by the mo'o. To get away, he swam under the lava shelf and escaped through the tunnel. The mo'o tried to follow but was too big and got trapped in the tunnel. His growling is the noise that you can hear today. There used to be a much larger blowhole nearby that shot water up to 200 feet into the air. Unfortunately, the salt spray was determined to be destructive to nearby sugar cane fields so the opening of this hole was blasted away in the 1920's and it no longer spouts water into the air.